Laid-back haunt pairing inventive cocktails with classic drinks, pub grub & a library in cozy digs. Ambiance: A cozy little bar serving pub grub and tasty drinks. In the back there is a lovely reading room, piled floor to ceiling with great books and a service bar with absinthe fountain. Selection: While the selection of absinthes is limited, they keep it focused on good brands; Vilya, Corsair, Pernod, etc. Service: With the addition of their new absinthe fountain, their preparation is on point, not to mention the tasty absinthe cocktails. Bartender Dan Searing boasted that every great drink can be made even greater by adding absinthe. 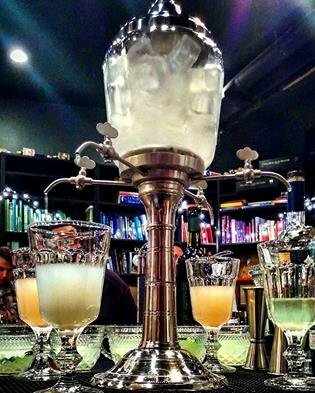 Knowledge: Judging by the absinthe education seminar they put on last weekend, Dan and his partner Chantal know a great deal about the drink and its history. Overall: What a wonderfully quaint little escape in northern DC. I highly recommend it. 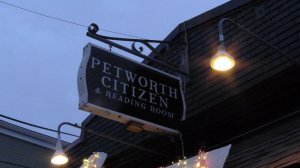 If you can, get tickets for some of their educational seminars (this weekend is Irish Whiskey, and next weekend is Sherry! ), or attend one of their cocktail events that center on cocktails inspired by literary works. Price: right in line with a good cocktail bar.